Is there a good success rate when it comes to turkey hunting in Missouri? Missouri turkey hunting is routinely among the best in the nation, and there are very few hunting lodges like Lost Quarter Farms when it comes to memorable hunting trips. You've no doubt been on more than a few turkey hunts, but nothing compares to hunting wild turkey in the beautiful and historic surroundings of Lost Quarter Farms. We offer guides trips into the field if you're interested, and incredible hospitality and accommodations. Hunting for turkey in Missouri can be a rewarding experience, so make your reservation today and join us at out Swan Lake location! Contact us today to learn more about the wonderful accommodations and affordable rates at the best hunting lodge in the Midwest. Lost Quarter Farms is one of the most acclaimed hunting lodges in Missouri and the entire nation. We serve a nationwide and even a worldwide clientele, and offer surroundings that are a world apart from the trappings of modern society. Our cozy accommodations and down-home hospitality are quote the draw, and our turkey hunting is second to none. 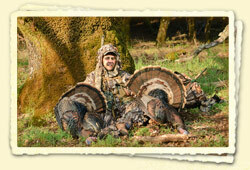 We accommodate those wishing to hunt solo as well as turkey hunts for up to 10 people. Missouri has always been known as one of the nations' very best spots for hunting turkey, and our hunting grounds are some of the most fertile in terms of success. Don't wait to make your reservation, call Lost Quarter Farms today. Make this turkey season one to remember.